30 X 8 Stamped Steel Baseboard Return - White Discounts Apply ! Baseboard vent covers are a great option for a new home or to update your current home.These return are grilles have a beautiful white enamel finish. 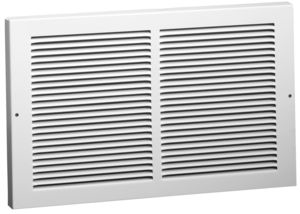 Baseboard vent covers are a sturdy design made of stamped steel construction. Your return air grille has a tough white enamel coating. Baseboard vent covers have a 1/3 of an inch fin spacing at a 20 degree angle. These return air grilles are ideal for new or existing homes. ***Hint: The industry standard is to order return air grilles using the actual hole opening size and not the faceplate size. Baseboard vent covers will fit a 30 x 8 inch hole opening. Baseboard Vent Covers Faceplate Dimensions (LxH): 31 3/4 x 9 3/4 inches. Return air grilles can be ordered in several sizes and finishes. Baseboard vent covers are an affordable opportunity to update your return air vents; place your order today!